One of the easiest ways to increase your average order value (AOV) this holiday season is with a classic upsell; a customer chooses an item to purchase, and as that item is added to the cart (or when they reach the checkout page) they're offered an upgrade to a bigger size or premium version. 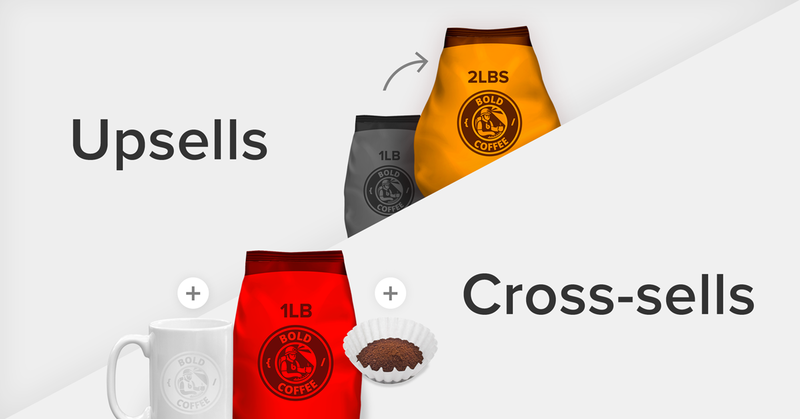 Another one of the oldest sales tricks in the book is the cross-sell; let's say someone adds a bag of coffee to their cart, you might offer them filters to go with it. If selected, the filters AND coffee get added to the cart. According to Forrester research, product recommendations are responsible for an average of 10-30% of eCommerce site revenues, so if you're not upselling - you're missing out big time! Well, the good news is you don't need to miss out on those extra sales anymore. 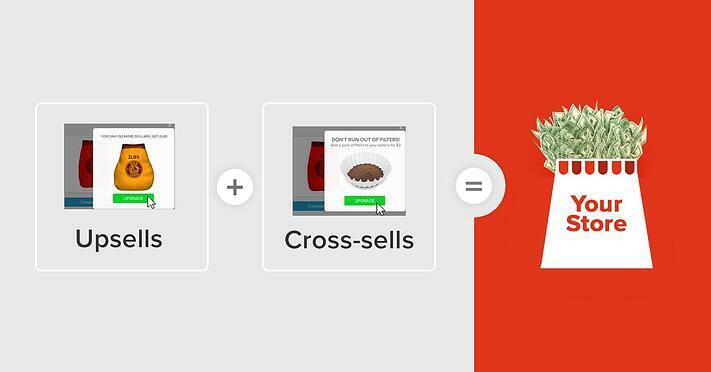 With Bold's Product Upsell app, you can now do upsells, cross-sells, or even both at the same time! Let's dive a little deeper into the world of upselling vs cross-selling and I'll show you what I mean. Brick and mortar stores in just about every industry have been doing it for centuries because it works! When you buy a leather jacket they offer you a leather treatment kit, when you buy earrings they offer you 20% off the matching necklace, when you go to the electronics store they offer you batteries and SD cards at checkout. In fact, upsell offers work so well that some stores completely rely on them to make their bottom line at their year end. If you're not offering upsells on your website right now, you're missing out on a huge amount of extra sales that you could be adding to every single order. Still not sure? Check out our guide on the most powerful upselling techniques with some tips and tricks to maximize your conversion rates. Okay, so what's the difference between the two? Here's the explanation you've always wanted. A true 'Upsell' is when a product is added to the cart, and a better or upgraded version of the product is offered, replacing the original one when added. --> "Would you like to super-size that?" For example, you might give them the option of buying a laptop with a faster processor for some extra $$. A true 'Cross-sell' is when a product is added to the cart and a complementary product is offered to go along with it. --> "Would you like fries with that?" So instead of offering to upgrade to a different item than they’re currently buying, you offer a complimentary item like a printer to go with their laptop. The video below explains it well. How does Product Upsell work? 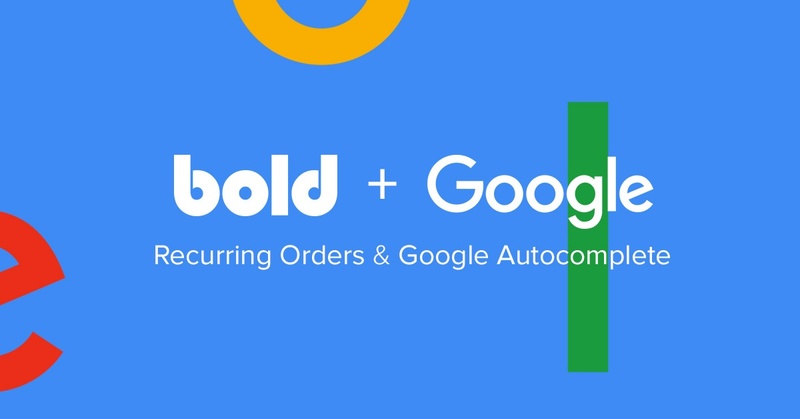 Bold's Product Upsell app gives you the ability to offer an upsell or cross-sell product at the point of checkout based on the contents of the customer's shopping cart. It's easy to install, quick to set-up, and can have your upsells up and running in minutes. Stores using the Product Upsell Shopify app have generated thousands and thousands in upsell offers to date, with a total overall conversion rate of 22%!! Could you be making more on every sale like these stores? You bet, and you can start today! You can now automate upsells on your Shopify store, generating data driven offers based on the data it collects from your store: it does all the thinking for you! You just download the Bold Brain, open it up, and your upsell offers will be waiting for you in just a few minutes. When you're ready, all you have to do is literally press "create upsell" and your offer will be up and running on your store. The Bold Brain uses hundreds of data points like order history, trends, interest, and intent. From that, it creates the most relevant, highest converting, upsell offers possible. If you also have the famous Product Discount App on your store, you can create discounted or free hidden items to use with your offers. They won't be visible on your store, but will still appear as an upsell offer at checkout, which means you can offer promotions never before possible! All you have to do is download Product Upsell Shopify app to get started. And the best news of all is that for the month of October, you can get Product Upsell FREE FOR 60 DAYS!! So go ahead, grab it here, and start using the #1 cross-sell and upsell app on Shopify to get your store ready to sell, sell, sell this Black Friday/Cyber Monday!